...Friction between the new Irish-Catholic immigrants and the established Yankee-Protestants was immediate, so when the Back Bay fill-in project (begun in 1859) created new property west of the Public Garden, many of those who could afford to move did so with little hesitation. As the elite moved further away from Scollay Square, the businesses left behind had a choice: either adapt to the new working-class clientele or close. Fine hotels like the American House, the Quincy House (Boston's first building made from Quincy granite), and Young's Hotel became more like boarding houses than the fine hostelries they were originally intended to be. Elegant restaurants became cafeterias. Haberdashers who once carried silk top hats now sold woolen scully caps. Dance academies became tap dance studios. And around the corner from Tremont Row, on Howard Street, the Howard Athenaeum, which during the 1850s presented William MacReady, the greatest Shakespearean actor of the day, twenty years later touted minstrel shows and seats in the gallery for just fifteen cents. It was night on the beach at Normandy, several days following the Allied invasion of German occupied France. Guards had been posted around the allied encampment with the warning: Be careful. A sudden rustling of bushes drew the quick response of a soldier standing guard. "Halt, who goes there?" he asks. "Private Smith, First infantry," came the reply. The voice sounded American enough, but the guard had to be sure, so he started to ask the voice in the dark some questions. "Where are you from?" he asked the intruder. "What do you know about Boston?" "What do you know about Scollay Square?" I would get in about a quarter to nine for a nine o'clock show, turn on the amplifiers and load the first reel of the first show. Then at nine I'd start the double feature, one A show and one B show. They weren't first run, by the way, since the real money was made from the stage show. The film just bought some time while the people filed in. At noon the candy butchers would come out. That would take about half an hour. Everything sold was supposed to be lurid and mysterious and, most importantly, from France. One of them actually sold empty boxes. He even told the crowd they were empty..."there could be a watch or a diamond ring but I'm telling you they are empty. "Then the stage show would begin. There was a four piece orchestra consisting of a drum, a piano, a trumpet, and a saxophone. One day Helen Green, a stripper, got drunk but insisted on going on because if she didn't she wouldn't get paid. She started out slow and was doing fine until she started going faster and twirled around and fell into the pit on top of the drummer. The strippers had some tricks. I had a dark blue light on them so it was hard to see, and they'd strip until they would jump backstage at the last moment. Some wore a G- string which they would cover with black wool so a quick look got the audience thinking they got a flash. High school kids used to get in by showing up early in the day when the movie was on and the ticket taker didn't care at that hour. The kids had to look fairly mature to get in anyway. Rather than argue they'd let them in. Also, the theatre sometimes got stuffy and they would open the fire escape doors which were not guarded. Mistakes happen, and there were a few made in the research, editing, and production of Always Something Doing and of Scollay Square. The ones of which I am aware are listed here. If you believe you have spotted any others, feel free to bring them to my attention in an email. 1) Due to an error in research, in ASD on page 12, paragraph 3, John Scollay (Boston's Fire Marshall in 1747 and later a member of the Sons of Liberty,) is incorrectly identified as the same man who leased the Winnisimmet Ferry in 1692. He wasn't, and it has since been assumed that he was actually John's father (as he is identified in a number of sources.) But research by descendants of the Scollay family now place the assumption in doubt. It's possible that the ferry owner was "actually a son of William Scollay (brother of 7.James Scollay) who also emigrated to Boston," according to one researcher. We continue to press for the final answer. 4) On page 58 of the Arcadia book, 1930 is said to be the year of the closing of the Old Howard by the Watch and Ward Society. That's a typo: the year was, in fact, 1933. 5) On page 79 of the Arcadia book, Lilly Ann Rose's receipt from Simpson's Loan Company is identified as being for a diamond necklace. It is for a watch. 6) On page 95 of ASD, dates for the Crawford House's founding on Brattle Street (1848) and expansion into Scollay Square (1860) are incorrect. Shame on me, because in the very first thing I ever read on the Square (Walter Muir Whitehill's pamphlet "The Metamorphosis of Scollay and Bowdoin Squares) says that the Crawford House was opened on Brattle Street in the 1860s. King's Handbook of Boston, published in 1895, says that the Crawford House was opened in December of 1865 on Brattle Street, and expanded into Scollay Square in 1874, and with no other source to confirm the dates in my book, I must assume that the 1865 and 1874 dates for opening and expansion, respectively, are correct. 7) NEW (March 2012) On Page 78 of ASD I quoted James McCarthy, a former member of the Boston police Vice Squad, who was there in the Old Howard theater in 1953 when film was taken of a performance of three strippers. 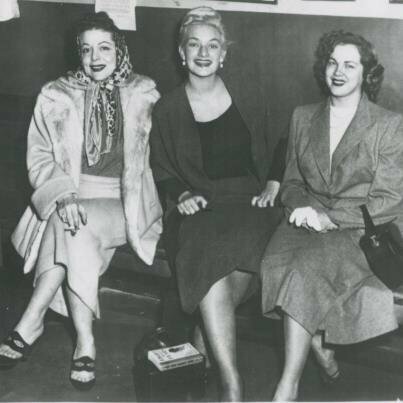 McCarthy told me in an interview that the three strippers who were filmed - and fined - by the court were Rose La Rose, Mary Goodneighbor (a.k.a. Irma the Body) and Princess Domain. But a series of posts on a Facebook site questioning the identity of that third stripper led someone to contact me requesting clarification. So I went back to the photocopies I still have of the newspapers, only to find out that I should not have relied entirely on Mr. McCarthy's memory. Here is the copy, from the Boston Globe on November 9, 1953: "Fined yesterday were Rose La Rose, Mary Goodneighbor, known as Irma the Body, Marion Russell and managers Frank Engel of the Casino and Max Michaels of the Old Howard." I never cross-referenced Mr. McCarthy's recollection with the newspaper accounts, which led to this error. So it was NOT Princess Domain (DoMay) who was the third stripper, but Ms. Russell. 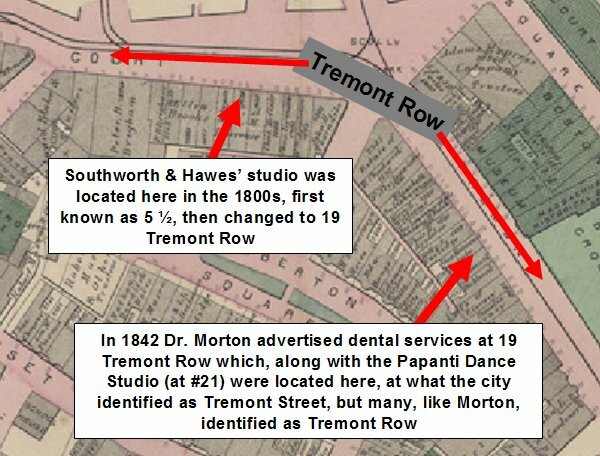 8) Dentist William T. Morton's office was located at 19 Tremont Row and the Papanti Dance Studio was located at 21 Tremont Row. Both of those statements are true. Both businesses had long been assumed to be on that part of Tremont Row which extended from Pemberton Square to Howard Street, which placed them across from Brattle Street, in the heart of Scollay Square - and just below the studios of photographers Southworth & Hawes. 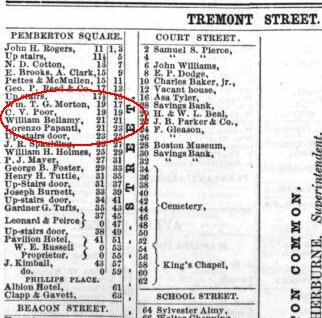 Recent evidence (brought to my attention by Rajesh Haridas, an Anesthesiologist with an interest in the history of Anesthesiology) shows that Morton and Papanti were actually between Pemberton Square and Beacon Street, across from the Boston Museum. slightly through the 1800s, further adding to the confusion of where Hawes, Morton, and Papanti were located.